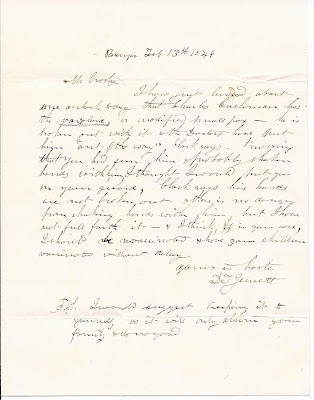 1846 letter from D. T. Jewett of Bangor, Maine, advising friend William C. Crosby, Esq. at Atkinston, Maine, about the possible smallpox diagnosis of a mutual friend, with whom Mr. Crosby had lately shaken hands. I believe these men were Daniel Tarbox Jewett, who later moved to Missouri, where he served as a US Senator from 1870-71, and William Chase Crosby, lawyer and businessman, born at Atkinson, Maine, in 1806. Their wives were sisters, which, I'm sure, heightened Mr. Tarbox's concern about the possible smallpox exposure of the Crosby family. Daniel Tarbox Jewett was born 14 September 1807 at Pittston, Maine, son of Daniel and Betsey (Tarbox) Jewett, born in New Hampshire and Maine, respectively. 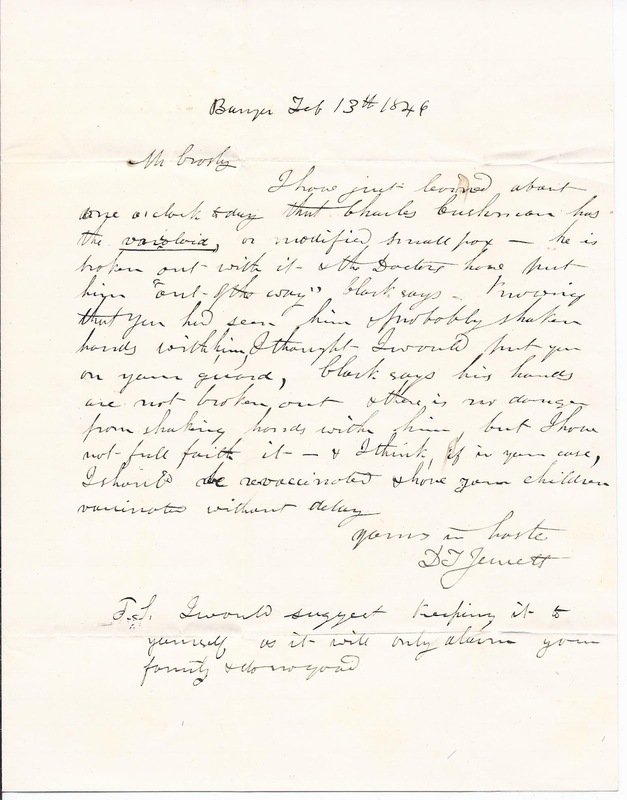 His paternal grandparents were John and Katherine (Jewett) Jewett. His maternal grandparents were Joseph and Betsy (Woodman) Tarbox. Daniel attended Colby College and graduated from Columbia University and Harvard Law School. He practiced law at Bangor, Maine, and became involved with city government, serving as city solicitor from 1834 to 1837. On 1 December 1848 at Roxbory, Massachusetts, Daniel Tarbox Jewett married Sarah J. Wilson, daughter of John and Hannah (Leach) Wilson. From 1850 to 1853, he and his brother operated a steamboat in Panama. He then tried his luck at gold mining for two years, before returning to Bangor to his law practice. In 1857, Daniel and his family moved to St. Louis, Missouri, where he practiced law and served in state government. He served out the remainder of the term resigned by Senator Charles D. Drake, but declined to seek a term of his own. Daniel Tarbox Jewett died in Missouri in 1906. William Chase Crosby was born at Dover, New Hampshire, in 1806, though some sources state that he was born in Atkinson, Maine. He was educated at the Gardiner Lyceum. He moved to Bangor, Maine, in 1828 and operated a business there until 1835, when he moved back to Atkinson to farm. After being admitted to the Piscataquis County Bar, he moved back to Bangor to practice law and became chairman of the East Maine Kansas Aid Society, formed for the purpose of organizing and financing groups of Free settlers in Kansas. He married Mary Wilson on 26 November 1832 and had, I believe, four children with her. She was the daughter of John and Hannah (Leach) Wilson and a sister to Sarah above. Mary died in 1865 of heart disease. William later married Mrs. Susan W. (Wheeler) Dunmore, widow of George W. Dunmore, and daughter of Daniel and Mary (Hinckley) Wheeler. I wonder if the Charles Cushman mentioned was Charles Chaplin Cushman, born in Vermont in 1804. 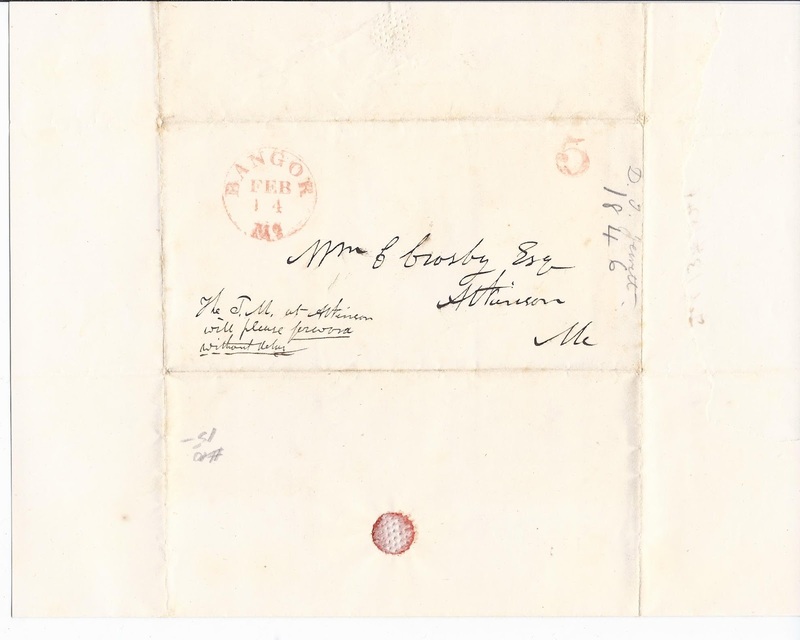 A graduate of the US Military Academy, he practiced law and was Penobscot County Attorney for a time at Bangor, Maine in the 1830s and 1840s. His children with wife Hannah Whittier (Sleeper) Cushman, were born at Bangor in the 1840s. 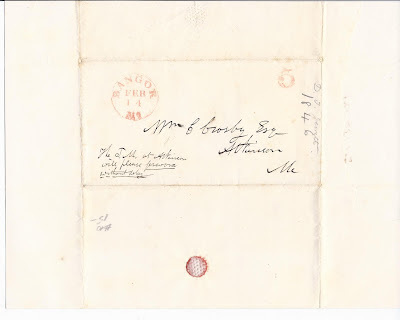 If he is the Charles Cushman cited in the letter, he survived his bout with varoloid, at least in the short run, and died at Milwaukee, Wisconsin in 1849. I have just learned about one o'clock today that Charles Cushman has the varoloid, or modified small pox - he is broken out with it. The Doctors have put him "out of the way", Clark says. Knowing that you had seen him, probably shaken hands with him, I thought I would put you on your guard. Clark says his hands are not broken out and there is no damage from shaking hands with him but I have not full faith [in] it - and I think, if in your case, I should be revaccinated and have your children vaccinated without delay. P.S. I would suggest keeping it to yourself as it will only alarm your family and do no good.